Formerly part of the estate of Miss Demerius Dollar, the land in the northern part of Trinity Park sits was divided into lots for sale in 1925. Development stalled with the onset of the Depression, however, and the 1937 Sanborn Insurance maps show only one house along the unpaved 1400 block of Dollar Avenue at that time. In the late 1930s, as the effects of the Depression began to recede and more money became available for construction loans, interest in these parcels for investment purposes began anew. In January 1939, C. C. Wilkerson and his wife Mattie bought the property at 1418 Dollar Avenue. Wilkerson, son of the well-known Durham building contractor W. Albert Wilkerson, was the sales manager at Johnson Motor Company on Main Street downtown. His brother, A. Ernest Wilkerson, was also a builder in Durham at this time. Mattie was the longtime office secretary for the builders Thompson and Cannady. Though we do not know who designed and built the house at 1418 Dollar, we see that it was built at the behest of a couple who knew the building trade inside and out. The house they had constructed is a one-story brick cottage with Minimal Traditional and Tudor Revival design influences. The house has an unusual form consisting of a pyramidal main block with a front gable wing. The entrance is set between the two, sheltered by a half-timbered gable supported by a decorative cast-iron post. The original windows in the main block had six-over-six wooden sashes, and the front gable contained large metal casement windows often used at this time. 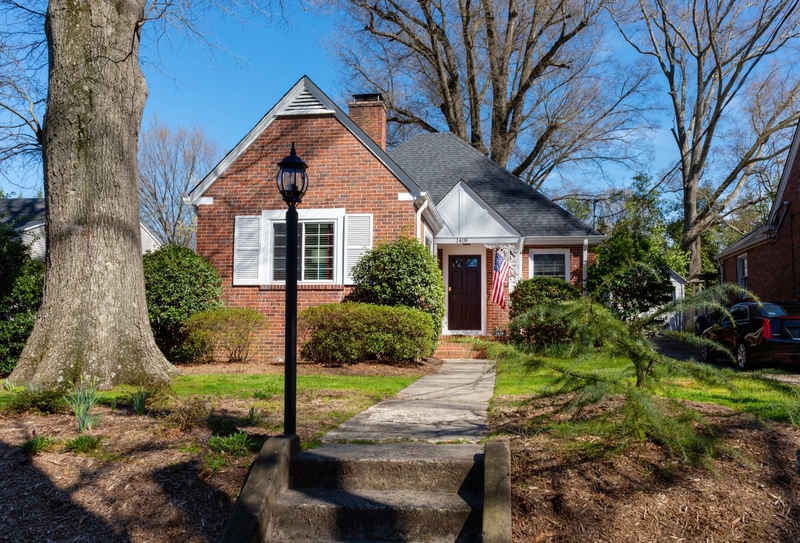 The Tudor cottage enjoyed a last blush of popularity in Durham in the late 1930s, with architects and builders influenced by the construction of Gothic and Tudor architecture on Duke University’s recently built west campus. Many notable examples of Tudor cottages were designed by local architect George Hackney and can be found in the northern part of Trinity Park, notably on the 1000 block of West Knox and Demerius Avenues [including one for himself at 1012 W. Knox]. Building handbooks from this period stressed the importance of layout in planning small houses. Main living rooms were to be placed to receive maximum sunlight and cross breezes. Kitchens were to be placed on the northern side of the house to keep them from receiving the heat of direct sunlight. Halls were to be minimized to save space, and eating areas could be placed in kitchens to save space as well. Bathrooms and bedrooms were to be placed away from the main living area to maximize privacy. All of these concepts were incorporated in the building of 1418 Dollar Avenue, whose most unusual feature is the large living room which was originally accessed only by the one door near the entrance and thus set off completely from the main block of the house. The original large metal casement windows would have further “modernized” and differentiated the space. The tidy, attractive, and well-built house appealed to the newly married and upwardly mobile Duke University graduates R. Lynwood Baldwin Jr. and his wife Betty Pyle Baldwin who rented the house just after it was built. Baldwin’s father had opened Baldwin’s department store on Main Street in 1911, and the younger Baldwin had grown up in the family home in Morehead Hill at 904 Vickers Avenue. He served as the department store’s comptroller at the time the couple lived on Dollar Avenue and would eventually assume ownership of the store. The Baldwins had three children while living at 1418 Dollar Avenue. They put their two young daughters in the second bedroom and their baby boy slept in a crib in the dining room. When their fourth baby was on the way, the Baldwins moved to a new, larger home of their own in Hope Valley. In late 1949, Edward J. Evans and his wife Frances C. Evans bought the house at 1418 Dollar. Evans and his first and later second wife made this house their home for the next fifty-seven years. Evans grew up in Oxford, North Carolina, and moved to Durham as a young man to work for Liggett & Myers Tobacco Company. He was a supervisor in the maintenance department when he retired after forty-five years. His second wife Alice Lee Canada Gearhart Evans also worked for Liggett & Myers, retiring after thirty-four years. The home’s current owner has been in the home for over ten years, continuing to care for it and make it her own. She added a door opening in the wall between the living and dining rooms, connecting the spaces and bringing more light into the dining room. She replaced the original appliances and white wooden kitchen cabinets with a modern kitchen and has added (or will be adding) new tile in the bathroom. She recently had the interior freshly painted. Though most of the original windows have been replaced, the original wood floors remain and the home retains the quality and character with which it was built.